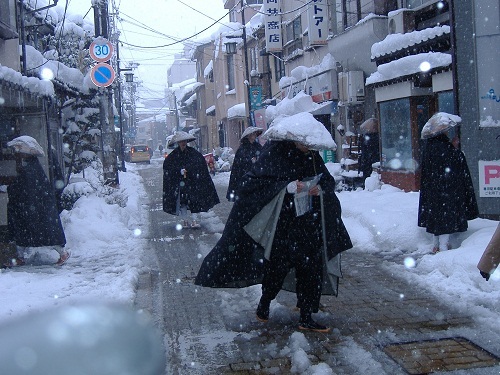 Zen priests of Daijoji Temple do Kanshugyo, winter ascetic practices. 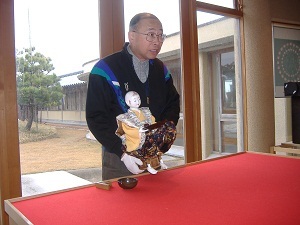 In the falling snow, Zen priests visit each household for donation. 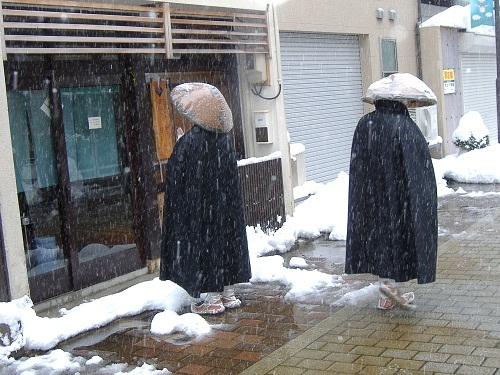 Zen priests are walking in heavy snow. 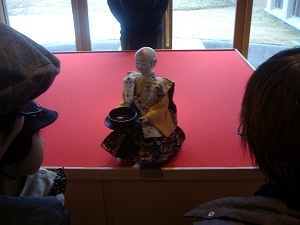 Zen priests put on Waraji, straw sandals and chant sutra. 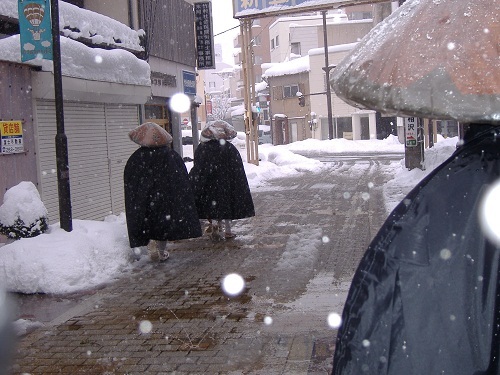 Snow is falling on the back of the Zen priests. 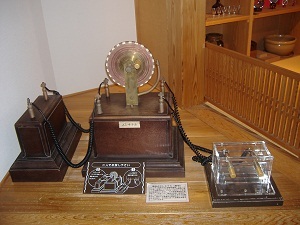 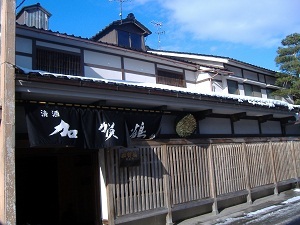 Fukumitsuya Sake Brewery has run a business since 1625. 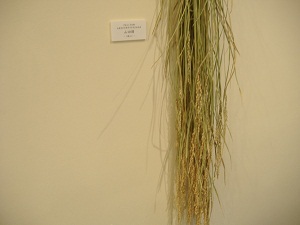 Sake rice, Yamadanishiki harvested in Hyogo Prefecture. 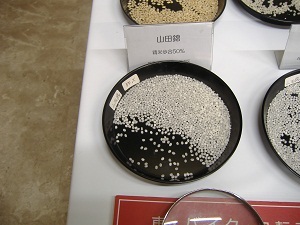 A grain of rice is polished 50 percent for Junmai-Daiginjo Sake. 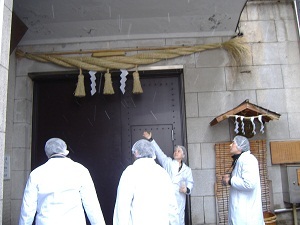 Shimenawa, sacred straw rope is decorated in front of Sakagura, rice wine cellar. 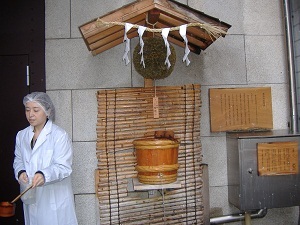 Making Sake is regarded as a sacred event in Japan. 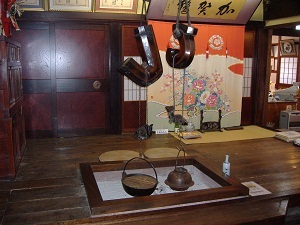 Hyakunensui, one hundred years old water, taken from 150 meter deep underground, which is rich in minerals is used for sake brewing. 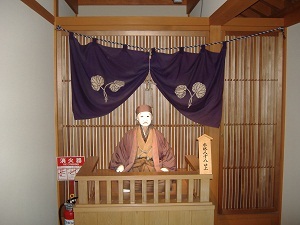 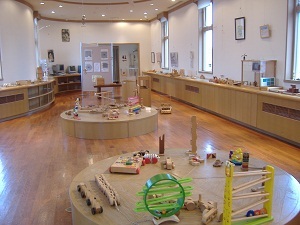 A sugidama, symbol of sake brewery is decorated. 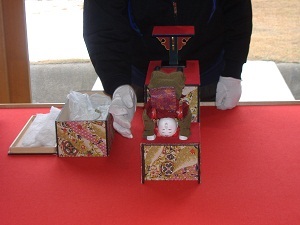 The needles of Japanese cedar come from O0-miwa Shrine in Nara Prefecture, where the guardian deity of the human life including brewing sake is enshrined. 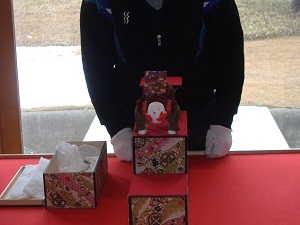 A new sugidama ball is made and decorated every November to show that new sake is brewed. 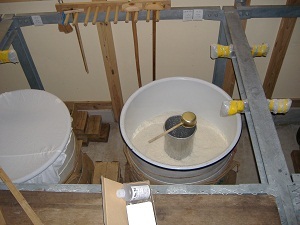 Yeast cells are developing in a tank. 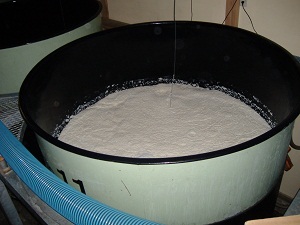 Steamed rice, koji, water and shubo are mixed togeter. 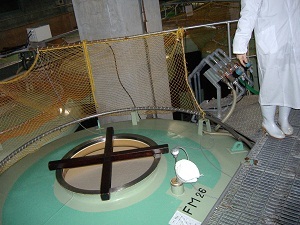 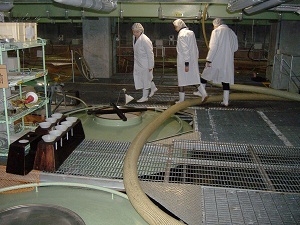 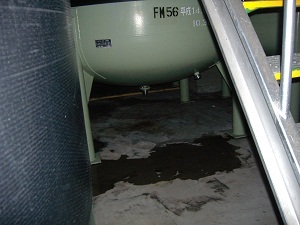 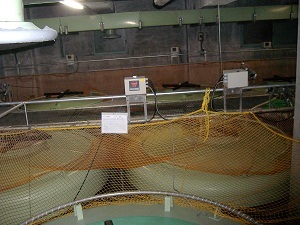 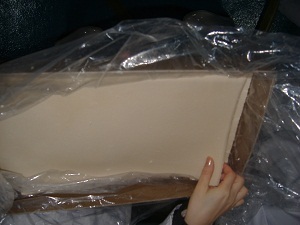 Moromi tanks shape round at bottom to get smooth mixtute. 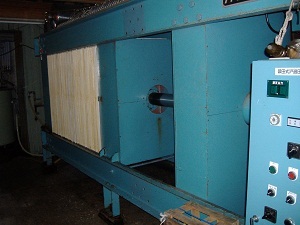 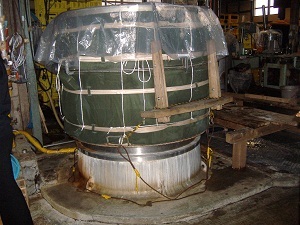 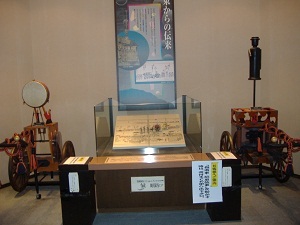 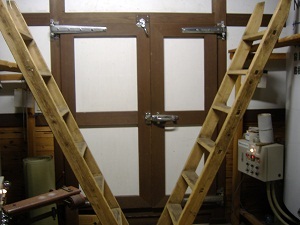 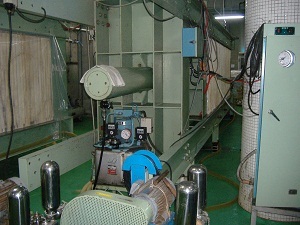 Press machine is used to separate Moromi into clear sake and sake lees. 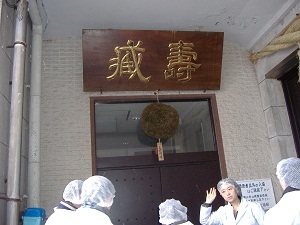 Sake Kasu, white sake lees are nutritious ingredients,which are rich in protein and minerals. 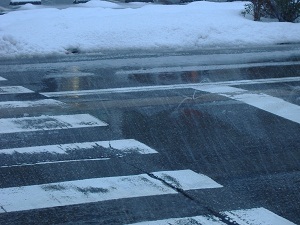 Sprinklers are installed on roads to thaw snow and ice. 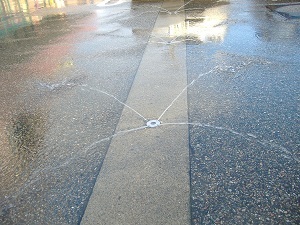 Each sprinkler has 4 small holes to spout water. 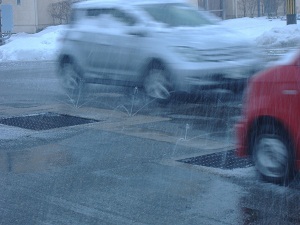 Cars are running in spurting water from sprinklers at an intersection. 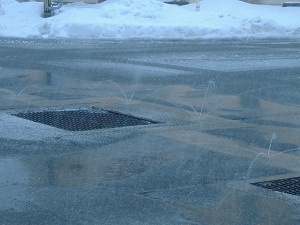 Spurting water at an intersection. 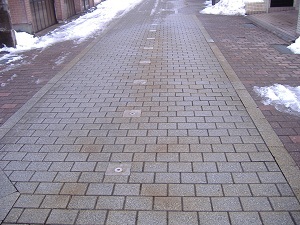 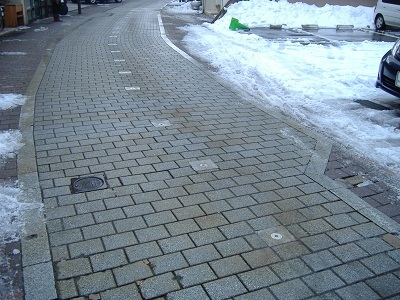 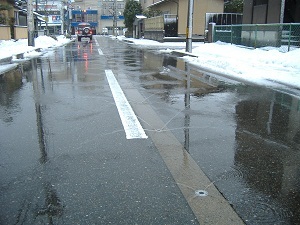 A pedestrian crossing is cleared by sprinklers. 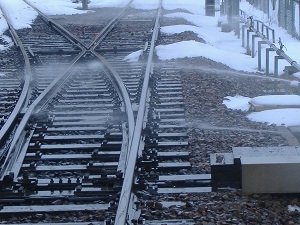 Sprinklers wash a switch of tracks for not stuck on snow. 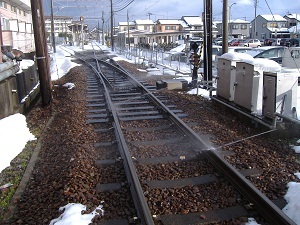 A switch sprinkled by water. 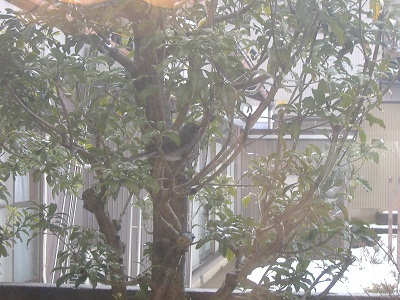 A bird perches on a branch. 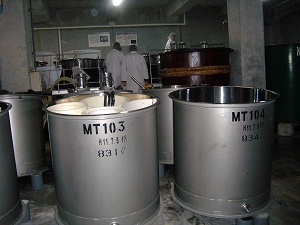 One is for cooking and the other is for warming sake to serve for customers. 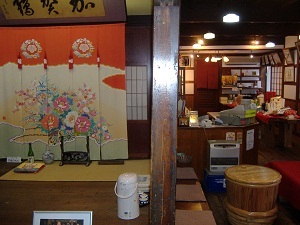 One of the pillars is installed leaning toward outside intentionally, which resembles in bowing to customers.It shows the sake brewery’s wishes to invite more customers. 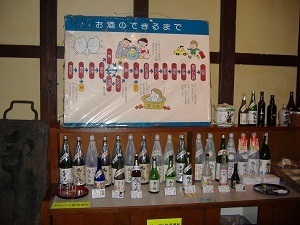 Variety of Sake is produced by YachiyaShuzo Brewery. 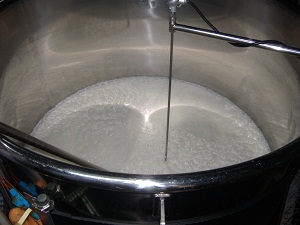 Sake mash sits about 20 days. 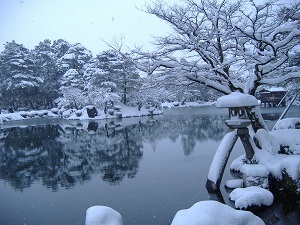 Calm white snowy Hisago-ike pond gives serein and quiet atmosphere to visitors. 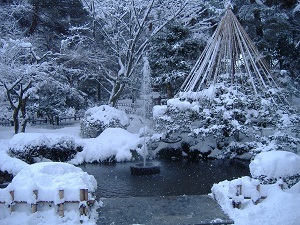 The lonely fountain is spurting out water surrounded with a pile of snow like a lonely dancer dancing alone. 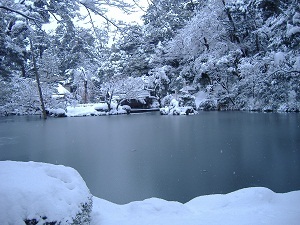 Kasumiga-ike pond is reflecting Horai-jima island, where a legendary wizard is supposed to live enjoying immortality. 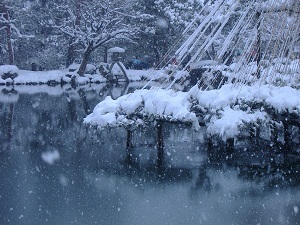 Kotoji stone lantern shoulders white snow. 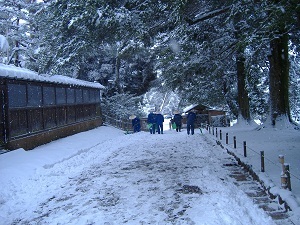 Karasakino-matsu pine is supported with straw ropes from heavy snow. 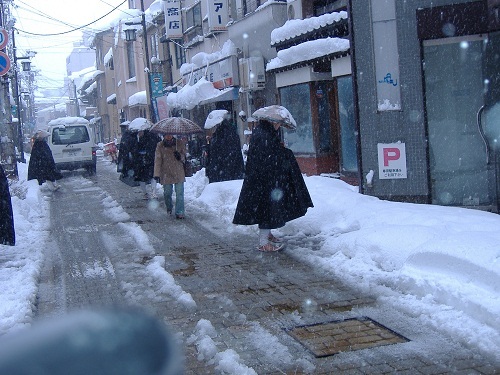 Garden laborers shovel show from the path. 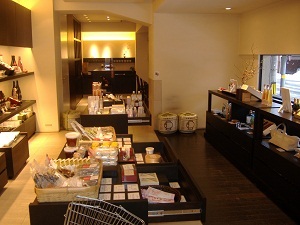 Clouds move away and the sun shines. 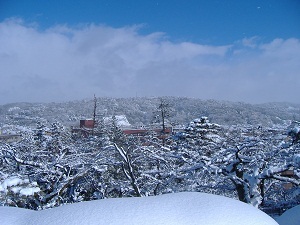 Snows on tall trees sparkle. 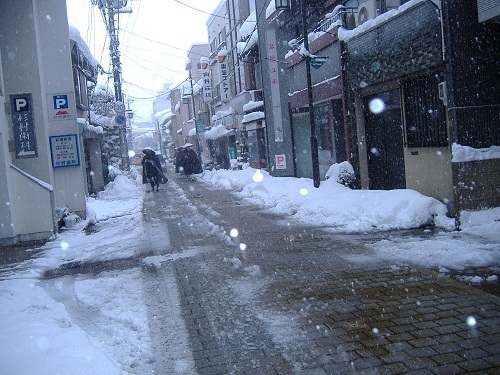 A beautiful scene is beyond the expression of words. 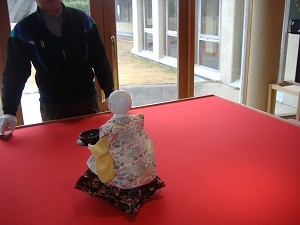 Some says ” Wow” ,which must be an appropriate word. 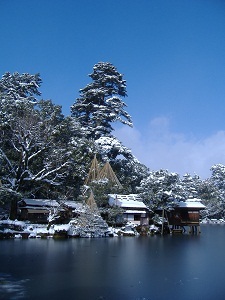 Uchihashi-tei tea house protrudes into Kasumiga-ike pond. 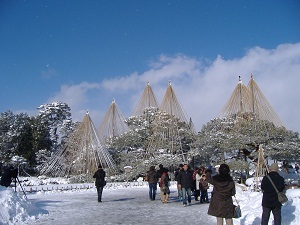 Straw ropes are spread over crawling pine look like unfolding umbrellas. 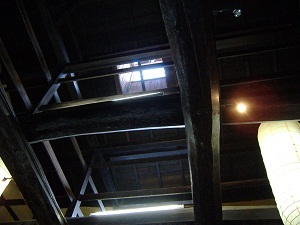 A wide view is thrown into your sight.